You love playing field hockey, but do you know where and how the sport you dedicate all this time to originated? If not, then you’re in luck, because we’re here to help. Forms of the sport can be traced back to as far as the ancient times in Egypt, Persia, and Greece, but field hockey as we know it today was developed a little later than that. It was still a long time ago, though – the late 19th century in the British Isles. You can thank Constance M.K. Applebee for bringing field hockey over to the United States of America, which she did in 1901. The rest, as they say, is history. Applebee spread knowledge of the game to colleges like Bryn Mawr, Holyoke, Wellesley, Vassar, and Radcliffe, and her influence helped the sport grow from there within schools, colleges, and clubs alike. The United States Field Hockey Association was established as the national governing body in 1922, which was specifically for women. For men who played field hockey, they didn’t get a national governing body until 1930, which was called the Field Hockey Association of America. These two associations didn’t merge until 1993, when they turned into the USFHA, the official field hockey organization that’s recognized by the Olympic Committee. With regard to the field itself, players will spend time on one that is 100 yards long and 60 yards wide. If you’ve ever played field hockey on synthetic turf, you’re well aware of the difference in how the ball travels from player to player. However, playing on real grass is the most common route for most high schools in the United States. High school field hockey consists of two separate 30-minute halves, with each team allowed to call two time-outs. After every goal, play is re-started by a pass from the center of the field, which can be done in any fashion. In order to score a goal, the ball must be touched by an attacking team’s stick inside the shooting circle of their opponent, which is a semi-circle that extends from each goal line. Dribble: This happens when a player is controlling the ball while moving and alternating the ball from each side of their body to keep it away from defenders. Hit: Any contact that is made by using a swinging motion, which typically happens for long passes or shots on goal. Scoop: Lifting a stopped or slower-moving ball off the ground by putting the head of one’s stick under the ball and shoving it forward. 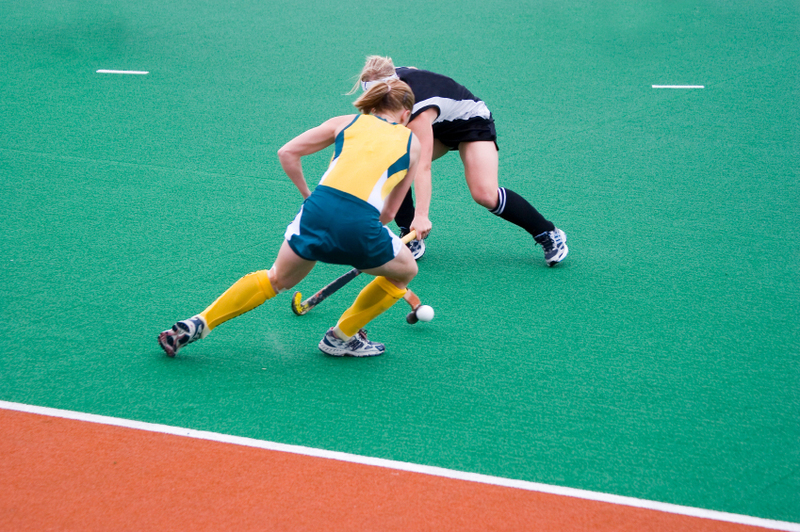 Tackling: This is a player’s attempt to steal the ball away from an opponent by using their stick. 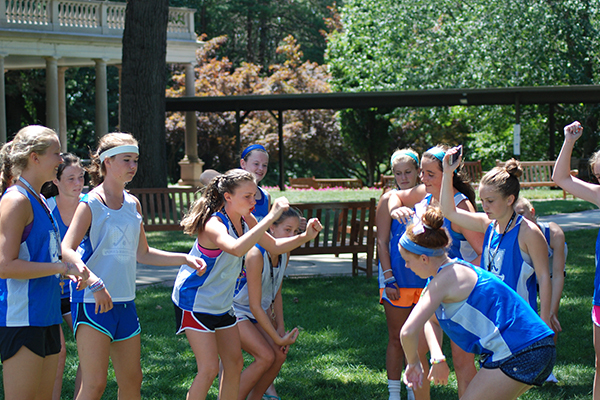 If you’re interested in learning more terms used within the sport of field hockey, be sure to check out this link. 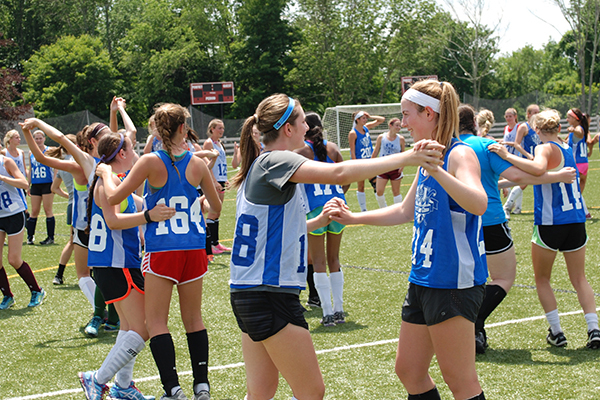 We’d love to help you get more acquainted with the sport at one of our Revolution Field Hockey Camps – hope to see you there!